The Second European Convention closed yesterday. Is that of any consequence for youth work in the UK and perhaps especially England? We’ll try to say more about this next week. In the meantime this is an initial reaction from Pauline Grace, who I can vouch hardly stopped for breath over the four days. So far this week I’ve managed to rekindle my passion and commitment to political, social, economic and philosophical debates within and about Youth Work. I’m exhausted and I’m not even involved in the huge task of trying to capture the conventions thoughts to be written up in the shape of the declaration – hats off to the dedicated hard working group that will be working through the night on that one! But I am tired, tired because I’ve spent almost every waking hour since Monday immersed in the narrative and discourse of youth work. Is that really hard work? Well I suppose I’m no manual labourer so to equate this experience to hard work might be slightly disingenuous. 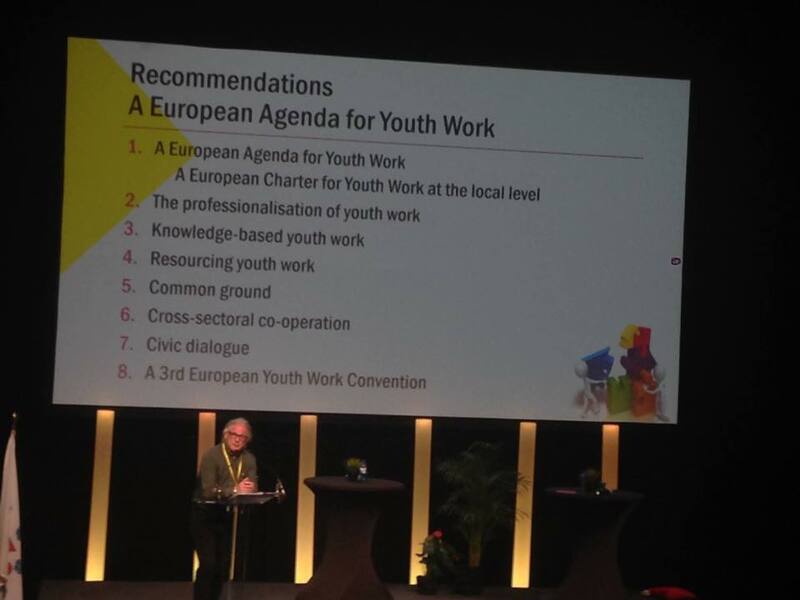 Hard work in this European Youth Work Convention 2015 context means Intense full-on days full of guest speakers, politicians, workshops and declaration preparations minimum 12+ hours per day and that’s without the ‘networking’. That even whilst eating or on coffee break the conversation continues and there is little space or time to contemplate other aspects of daily existence. For me it is essential that we have this wide ranging exploration of youth work at a European (Global) level if we in England are ever going to survive the culling of state funded youth work. We are going to need the allies of our European colleagues and friends to help us maintain a sense of purpose and direction. In these depressing and sad times when good youth workers have been made redundant, young people have lost access to youth work projects and processes, missing out on the incredibly positive experience of learning about themselves and others, about the world and where they fit (or don’t). It is even more important to find collective shared narratives to remind us of why we are bothered at all. Youth work for me has always been more than a job, it’s been a vocation. Which I guess in some people’s eyes makes me a very sad bunny! But so far I’ve met with some amazing fellow travellers, people who have dedicated their whole life to working in a democratic liberatory and emancipatory way with young people. Workers committed to working with and alongside young people, workers who are on young people’s side, who consciously and deliberately seek to support young people in the face of moral panics and stereotyping. I’ve meet researchers, activists, policy makers, high flying Eurocrats, ordinary volunteers and all with one thing in common…. A deep felt commitment to young people and youth work. Feeling shattered, proud, enthused and hopeful!